Cliffe FC Sunday qualify for the next round of the York FA Cup with a 6-2 win, dominance featured through out as they led 4-0 at the break. The four goals in the first half were superbly worked goals, opening goal saw Tom Collins and Andy Edwards work a cross that was finished first time by Tom Hogg for 0-1, a goal Arsenal would’ve been happy to score past Chelsea. Another cross into the box saw Hogg double his tally, bullying the ‘keeper in the air before prodding the loose ball home, 0-2. The return of Nathan Parker was felt by Beeswing’s defence (Parker scored 9 in one day past Beeswing end of last season) – first Parker deflected a Hogg shot into the net to deny Hogg his hat-trick but get his first of the game, 0-3, then a stooping header from another Edwards cross made it 0-4. HT. Cliffe dominance continued into the second half, Andy Kirkham was relentless in the middle of midfield as he continued to hassle the Beeswing midfield and fullbacks whilst Kev Taylor sat in a holding role in the middle of the park. Matthew Birch’s solid display saw him earn MOTM with elder Birch brother, Scott Birch in the goal covering for Ally Harris who picked up a knock on Saturday. Kirkham finally got his goal, a deflected shot from outside the box for Cliffe’s 5th, and an Edwards penalty for Cliffe’s 6th deserved goal. The away side may have been guilty of letting performance drop, as Beeswing scored two consolation goals, 2-6 was the final score. 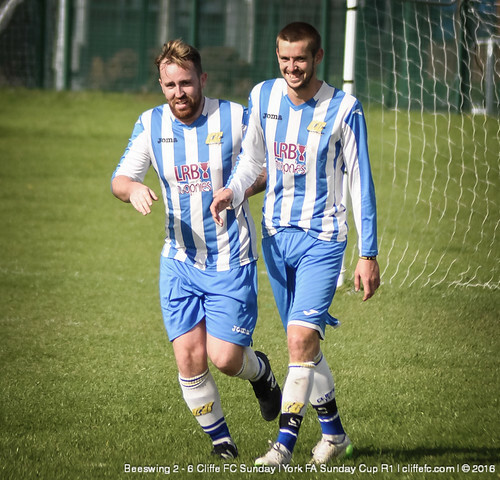 Cliffe FC Reserves are out of the FA Cup, after a narrow defeat to Hemingbrough Utd Reserves, a case of Cliffe not scoring their chances and probably the more deserving team to go through. Cliffe’s goal came from Tom Ellwood. The telling point of the game saw Hemingbrough score the eventual winner moments after Jay Grundy’s shot struck the bar at the other end. Scott McGowan missed a penalty at 1-2 to bring Cliffe level as Hemimgbrough held on for the win to qualify for the next round. MOTM: Elliot Clark. Next week, Poppleton United Reserves are the opponent’s in league action at Oxen Lane. The gap between Cliffe’s rebuilding, and Wigginton’s title challenge squad is evident as Cliffe are handed an 11-0 defeat in the Senior FA Cup. It was always going to be a tough draw, away to last season’s Premier Division runners-up, just like last season, and Cliffe set up to defend but Wiggy raced into a 6-0 lead at the break. Cliffe had a number of chances however, and whilst Wiggy scored more goal in the second half, the goals were scored at the start and end of the half, as Cliffe managed to have a good 30 minutes during the second period. 11-0 was the scoreline, but some positives to take whilst obvious lessons to be learned. All the best to Wigginton in their title hopes and FA Cup campaign. MOTM was young Liam Tomlinson, worked tirelessly at such a tender age whilst been asked to play out of position at times. Next week, it’s Malton and Norton’s Reserves away in County Cup.